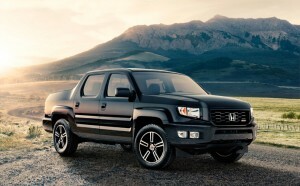 At Middletown Honda, we’re happy to be able to bring the 2013 Honda Ridgeline to drivers across the county. The Ridgeline has been steadily getting critical praise and accolades since it’s inception ten years ago, and the 2013 model is no different. It’s hard to compare such a versatile unique vehicle to anything, as it is one of the premiere sport utility trucks on the market. There are still competitors, though, like the 2012 Nissan Frontier, which features a similar amount of seating paired with a truck bed. Let’s look at the specifications of both vehicles and see how they match up. The Ridgeline gives drivers the power they need, 250 hp and 247 lb-ft of torque to be exact, while beating the Frontier on fuel economy. Other attractive elements of the Honda drivetrain include full-time 4-wheel drive and a locking rear differential, neither of which are option on the Frontier. The Ridgeline gets a front and rear stabilizer bar as well, while the Frontier only gets front stabilization, and the Ridgeline is also set up with towing wiring as a standard feature. Power accessories like windows, door locks, and cruise control are standard on the basic Ridgeline, but unavailable on the Frontier. And you and passengers will be more comfortable in the Honda, thanks to an improved size across the board. Front and rear occupants will have the freedom to move around that you won’t get in a Frontier. Both of these trucks have great safety features including front and active head restraints to protect against rear impact injuries, front, front side, and front and rear side curtain airbags. Despite this, Honda’s pickup scored higher in NHTSA safety tests, earning a 4-star rollover safety rating, while the Frontier only took home a 3-star rating. As far as safety is concerned, the Ridgeline also gets a brake assist and an electronic parking assist with rear view camera, both options that aren’t available on the Nissan. Test Drive a New Ridgeline Today! Come take the newest Ridgeline for a test drive and see for yourself how it compares to its competitors. Middletown Honda is your local Orange County dealership, and we’re here to help you find your next car. See what other customers are saying about their Middletown Honda experience, and see what it’s like for yourself today!